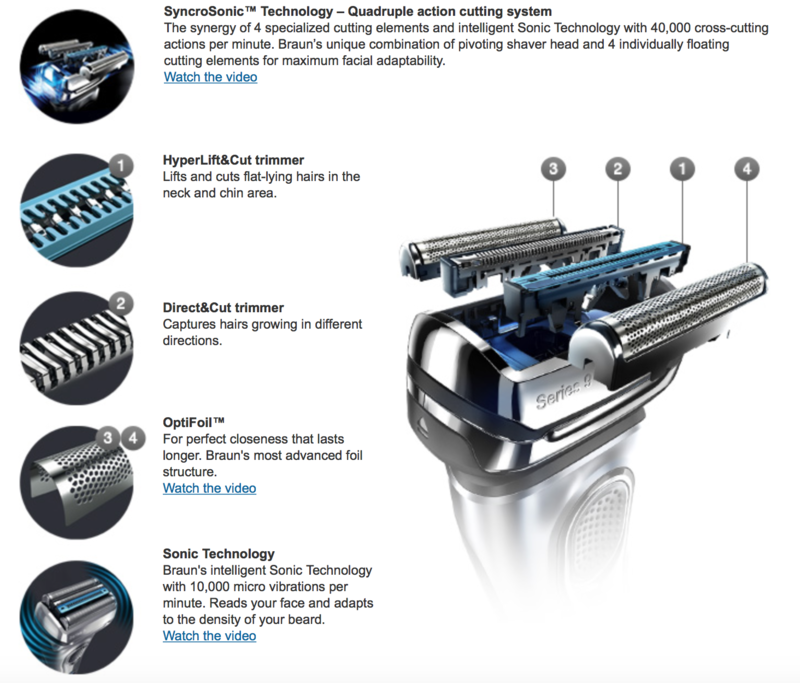 Braun Series 9 Review describes the new Braun Series 9 as the best shaving tool that Braun has ever released. This series includes four different, yet equally effective razors, two of which have the ability to shave wet or dry. The other two razors come equipped with a very helpful cleaning dock, which will raise the cost of the razors but will, in the end, be the most helpful option. This new Braun Series 9 Electric Shaver is the new-and-improved version of the previously released Braun series 7 shaver, which was also a very successful line of shavers. This new series is designed to get the ultimate close shave without a bit of skin irritation. The features of this product will have you convinced that this should be the only shaver even worth using. The design and look are very classy and attractive and allows for a steady grip. The SyncroSonic head is flexible, allowing for a better shave, and it even includes an alcohol-based cleaning system and can hold a good charge. Below are the new Series 9 shavers from Braun, and the specs will have you wanting one as soon as you’re done reading this review! The Braun 9095cc shaver is a top-of-the-line member of the 9 Series family. This electric shaver works wet or dry and gives an exceptional shave through its advanced shaving technology. 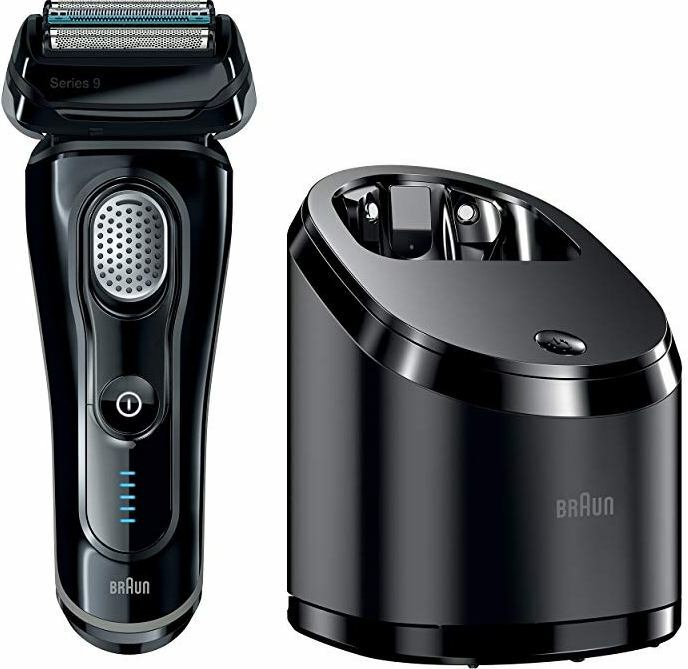 It has a 4-action cutting edge, which should reassure you that Braun 9095cc is capable enough to successfully deal with a wide array of beards- from the thickest beards to the thinnest of beards. Through it’s swiveling/pivoting head, this razor easily conforms to all contours of the human face, getting a closer shave. The Braun Series 9 9095cc shaver uses the opti-foil technology to ensure that skin irritation won’t be a problem if you use it often. The cleaning procedure of this shaver is quick, easy, and simple! From it’s wet or dry shave ability to its easiness and simplicity, the Braun 9095cc is a great shaver to use, though it may be a little pricey, it definitely gets the job done! Braun 9090cc is another top-of-the-line shaver in the Braun 9 Series. After using this Braun 9 Series shaver, this review is based on the product’s price, performance, and quality. The price of this shaver may be a bit pricey for you, but it certainly has a lot to offer you. This top-level shaver comes with a well-built, powerful battery as well as an effective cleaning station which is 100% hygienic. I recommend this shaver to those of you looking for a trusty product due to its close shaving performance. This razor will shave very fast by catching much more stubble than the shaver you’re using now. Just like the 9095cc model, it will not cause irritation from frequent use. The price of this shaver is cheaper than other Braun models. Though it doesn’t have an automatic cleaning option, it’s still simple to just clean the razor under some running water. This wet or dry shaver can perform 40,000 cutting movements per minute, so it really gets the job done. This shaver is a great option if you’re looking for a cheaper, yet easy and simple shaving option. 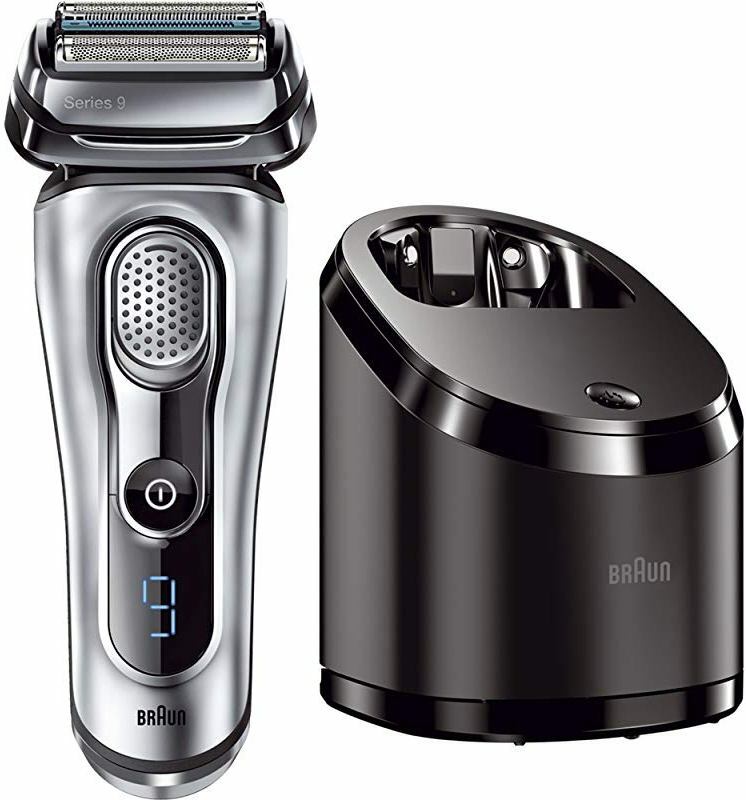 Braun 9050cc is the third razor in the 9 Series shaver that also comes equipped with an alcohol cleaning station, as well as a cleaning display. The charging station contains a five-stage charging display. You will instantly fall in love with this shaver after the first time of using it. This razor is so wonderful because it will take only half the time to shave your beard compared to other shavers on the market that will take longer. You will be impressed by the lack of skin irritation and even the lack of noise that comes from this shaver. 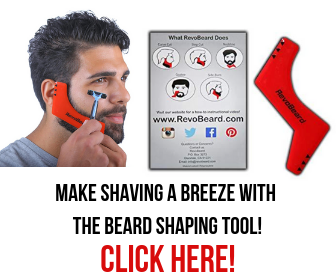 In addition, you’ll love how quickly it shaves and how quickly it charges. It may be a little bigger in size and it may have a little bigger of a shaving head compared to other razors, but it doesn’t decrease it’s comfortability while holding it. The Braun 9040s shaver is the fourth and last model of Braun Series 9, which is very comfortable and easy to use. This shaver also comes with advanced syncroSonic technology to deliver even more than 4,000 cutting motions in just one minute, which is great for a fast shave. This shaver is designed with a cutting head that is horizontally aligned in a classic mood. You will get a completely different experience with Braun 9040s than the other three models. This wet/dry shaver can be used in an up and down movement or straight motion. The charging station and hygienic cleaning system are faster, better, and more efficient than the Braun Sever Series 7. Out of all four shavers, this one is the cheapest. Why Buy Braun Series 9 Shaver? The Braun 9 series has two foils just like the 7 series, but the Braun Series 9 includes two separate special trimmers. The one razor is special due to its ability to lift up the low lying hair and cut the hairs from the very end. The trimmers can also shave the dreaded and hard to reach places like the chin and neck. The other shaver’s specialty is in cutting hair that is growing in any direction. These kinds of hairs are especially hard to cut very closely with only one stroke, but the new Braun Series 9 is specifically designed to get rid of the tough hairs in one stroke. These shavers also eliminate the nuisance of irritation, including burns and cuts. No matter how short or thick your hairs are Braun Series 9 is ready to have a fight with them. Many things are similar to the Braun Series 7, for example, the shaver head. Though this Braun Series 9 has the pivoting shaver head like the Series 7, the head is much more improved now. The SyncroSonic head is actually a combination of four separate operating kits and each of them floats independently, yet still work together to conform to the facial structures and contours of the face. The SyncroSonic Technology ensures 10000 vibrations per minute, which will easily shave any kind of beard and will create a better shave. All four models of Braun Series 9 are 100% waterproof, but among them, only two have the capability of shaving while your beard is still wet. These razors are perfect for those of you who like to shave in the shower. The only shavers with the wet or dry shaving capability are the 9040s and the 9095cc, however, the only downside to the 9040s is that it doesn’t have a cleaning station. Braun is the inventor of the cleaning dock system and only Braun can provide you with the best cleaning dock. The alcohol in the cleaning dock will keep the shaver clean and always ready for the next use. You can also be reassured that the next time you use it, it will be 99.9% clean and free of bacteria. It not only cleans the shaver, it will also charge it. All the shavers of Braun Series can recharge very quickly, and after just one hour of charging, you will have 50 minutes of shave time, which is enough to get a nice and close shave. “The very first thing to notice about this kit after reading experts Braun Series 9 review is how stunning it is. The beautiful ergonomic layout, LED display and contoured grip make this a stylish tool to any restroom. The Clean and Charge system within which it stays looks properly compact on the bathroom shelf. However, the real test would be how it performs. I admit that I have forever been a wet-shaver, but I was keen to observe whether the Braun Series 9 shaver packs what it preaches. I was not going to let it slide easy. I used it to tackle a four-day long beard patch”. Utton then goes on to explain that he’s never used electric shavers before and that he is very prone to rashes and irritation. He says he has a sensitive face and he was only a bit nervous when holding a razor to his face. To his surprise, the shave was incredibly smooth and he didn’t notice any tugging or pulling of his facial hair. ....is a perfect example as to how smooth the Braun Series 9 shaver really is. He explains that he did not feel any unwanted heat from the shaver and that is was comfortable even with the vibration and noise. Utton also says that the trickiest parts weren’t all that tricky thanks to the pivoting head and its ability to conform to the contours of the face. He also used to his shaver for some “neat sideburns”. Unlike every other razor, it doesn’t leave behind any irritation or nick on the skin. All-in-all, from Utton, it was much easier and faster than what his usual shaving routine is. He didn’t find the need to do a whole pre-shave routine and he did not find himself dabbing at his skin afterward to help heal some cuts. Cleaning up was easy from him too. After just simply running the razor under some water, he put it in the clean and charge station, touched a button, and the shaver was cleaned and lubricated for the next use. He also says “the place also smelled like barber shop”, which is an added bonus. In the end, the Braun is a great way to go due to it’s low charge time and 50 minutes of cordless use after just one charge. The LED display tells you how much time you have left before the razor dies and tells you when it needs to be cleaned. “In short, I loved it. It looks great, performs fantastically and made the whole business of shaving a lot less of a fuss.”. Braun continuously breaks all the boundaries and tackles the significant and obscure challenges that men often face while grooming. After introducing the Braun Series 9 Shavers, they were labeled as the “world’s finest electric shaver”, regarding skin comfort and efficiency after trials and tests on beards that had been growing for three days. The SyncroSonic Technology is advanced something worth bragging about since it lets you get a clean shave with just a few strokes and creates less pressure on your skin. Every element has a unique function – the central 2 trimmers called the “Hyper-Lift and Cut” and “Direct and Cut” work specifically on the flat-lying hair and hair growing randomly in different directions. This, combined with the two Opti-Foil shaver foils on the sides that cut the hair close to the skin, the Braun Series 9 constructs a harmony of precise shaving features in a single electric unit. They are also powered by a Linear Drive Motor which generates ten thousand micro-vibrations and delivers 40,000 cross-cut actions per minute. Skin irritation becomes a thing of the past because of its smoothness and non-existent friction. With meticulous researching and feedback's from users, Braun has mastered cutting different kinds of hairs and contour to provide the perfectly efficient shave for you. The Braun 9 series 9090cc shaver motor even has an automated system that will clean and lubricate with its easy cleaning tool. The shaver could be cleaned up with water or solutions that you could pour into its cleaning station easily. Make sure that you mix the tap water with soap, using a brush in order to remove the clogged beards or shaving foam from the head. The battery could be charged by using the Clean and Charge station. I advise leaving it completely charged so you aren’t bothered with small and quick charges each time. The good news is once its battery is charged, you have 45 to 50 minutes of constant shaving before the battery dies. The average user shaves for only 5 minutes, so 45 minutes will last you roughly three weeks. Be sure to consider the fact that electric shavers all have non-replaceable battery units, meaning you must get a new one after awhile. Most electric shavers require regular lubrication, but this is different. The shaver oils and lubricates itself while the clean & charge station cleans it. The cleaning formula in the station works for a lubricant too, so the blades will get cleaned and lubricated too. The formula also has a lemon scent that makes it smell great. To get the best use out of it and the best shave, be sure to replace the razors about every 18 months. The cleaning is simple and easy, and you don’t have to do anything to do so. Cleanings only take about 30 seconds! It would detect when the shaver was cleaned last before giving the correct cleaning method. Consisting of 4 cutting elements - 2 trimmers and 2 foils. The elements are smartly blended to provide the cleanest shave with its sonic technology, which adapts to beard density. The Series 9 could mow all the way through a three-day old beard in seconds. Comfortable, and gets the job done without any nicks or cuts. The function of this is simple and intuitive. You just press that large power button while you wish to start it, and select the mode of your choice – dry or wet. The shaver is particularly useful for those who dislike shaving daily and skip every few days. It is powerful enough to shave overgrown hair, unlike all usual shavers. The sound level on this shaver is significantly less than other similar products and its smooth vibrations give you a relaxing and calming sensation. Generally, it is a great shaver which should stay with you for a while, which really justifies the cost. Ultimately, the Braun Series 9 review shows you why the series 9 shavers are the best for all of your shaving needs. The sleek design and advanced cutting technology of the Braun Series 9 9095cc Wet & Dry Shaver tell you why it is going to be the world’s leading electric shaver. Being the latest shaver that is using the newest technology, its price is a bit higher compared to others, but it’s lab tested, and the results show that it’s going to be the leader in the near future of foil shavers. If you are searching for a new shaver to replace your current one, then you must try the new Braun Series 9 electric shaver. If you have sensitive skin, are looking for a close shave, or have a coarse beard then the Braun Series 9 shaver is perfect for you. This amazing shaver also has a rubberized and textured grip area that features a signature dot design for secure handling. It guarantees safe and confident handling even for wet shaving. All the latest Series 9 models are now suitable for wet shave use and can be completely submerged in water. Please feel free to tell us your opinion and let us know what you thought of the shaver after purchasing it! Currently you can find 2 model series 9 shaver (9090cc – sold by amazon & 9095cc – sold by third party). Don’t worry soon other models will available at amazon.com and then we will update amazon discount link. Check back later. 9090cc is a awesome shaving kit, I got realized after my first shaving. 100% agree with D.White, this is a great electric shaver right now among all e shaver. Impressive result I got. Also thanks to Alex for recommending best one. While slight variations in shape and color may help modernize the overall look, men will likely continue to fall back upon traditional style choices. The foil head shaver moves rows of blades back and fourth, where as the rotary head has a motor that rotates the heads. But for best output we all should buy best one that can fulfill our needs. And I always like to use latest kit for my grooming purpose. And that’s why I searched Braun series 9 review and pick 9090cc model for having numorous customers positive reviews at Amazon. After couple of my shave I’m happy to recommend this one like (Alex). After reading this Braun series 9 review – I order it through Amazon & received this shaver few days ago. But after un-boxing, it exceeded my expectations for its structure. It’s cleaning & charging system is very easy to set-up and requires less instruction from user manual. The real shaving experience with this Braun series 9090cc shaver was unbelievable. It was impressed me from first shave and hope that this satisfaction will last long. Its pivot head is made this kit more better by including lock system. Thumbs Up to Braun! I have been using this electric shaver for about one months and it’s hard to believe that how much it impressed me. I haven’t faced any sort of negative experience while going through all types of shaving modes. This shaver head follows all the contours of face properly because of its flexible shaving system. Overall, Braun 9090cc shaver is great manufactured kits that can gives best results. I got this latest Braun series 9 shaver as part of a promotion. !! 🙂 !! 9095cc is a great shaver so far! I tried it few time before commenting in your Braun series 9 review posts and get very close shave. It is very easy to use in addition to feels immense while shaving. But it cannot give quite a close shave as a manual razor can. So what, It’s a latest and top rated shaver and will loved by the electric shaver lover like me. Famous brand Braun has done great job again by producing 9 series shaver. Its design, smooth contours and excellent quality will draw your attention first. Though its bit bigger than other models, but very comfortable in hands while shaving. I believe that Braun series 9 shaver will win heart of every user by its performance. I’m bit confused about the price of 9090cc shaver! After reading this Braun series 9 review, I decide to buy 9090cc models from Amazon but first day I saw its price is below $350 but next day when I going to buy from Amazon, I found that the shaver price is up and its near about $400 (even this models price is increased than 9095cc model). It was very much confusing and frustrating for me, that’s why I buy 799cc one within my expected budget and I’m satisfied with its performance. Happy shaving!! Braun is the leading brand when it comes to electric shaver & I am a big fan of this German brand. Previously I used series 5 and 7 and will use soon series 9 model. The problem is I cannot pick one among top two model 9090cc & 9095cc. I found many opinions while searching braun series 9 review on the web and most of them suggest to pick 9095cc for its wet/dry mode. Though I always prefer to use top models of previous braun series shaver because I believed that top one is special for a brand to satisfied their loyal customer. But this time I cannot made my decision yet. What you suggest to me Alex in word! Thank You for the meticulous review. Really love this electric shaver.